the project certainly had its ups and downs. saying that, it was lovely coming to the end of the street to finish on an up. 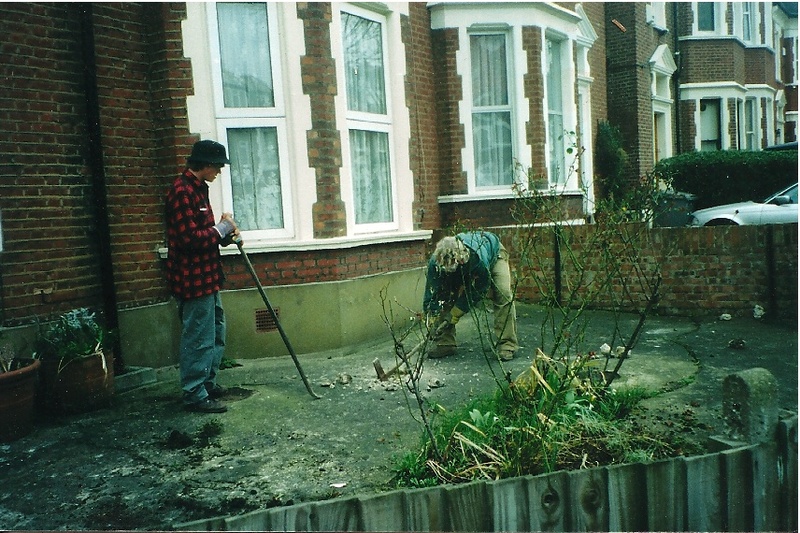 doing the front garden for John and Pam and their daughter Chrissie in memory of their son Steven was different to the rest of the street. certainly, we would have done this as part of the overall project, but we were able to incorporate the memorial aspect for Steven, who had passed two years before. he was a lovely fellow who had had enough of the lifelong, ongoing battle with cancer which had left him deaf, a particularly vicious effect because music had been his life passion. 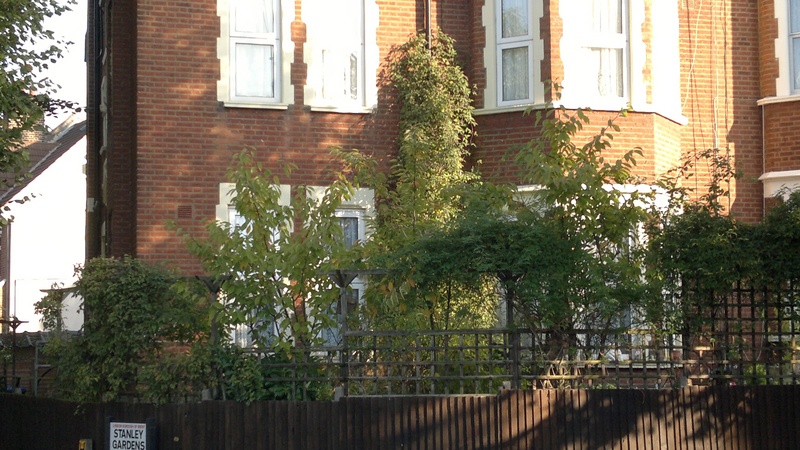 it gave a whole new dimension to the reconstruction of the front garden because it was dedicated to him. it was also special because John, Pam and Chrissie were lovely people who participated and contributed rather than criticising and negating, which we had sometimes encountered. Pam, if ever there was a charming, eccentric London housewife, Cockney character, it was her. as the project progressed, she’d catch me on the sly and say, “Don’t tell my husband, but there, take this!” and slip me fifty quid. very welcome indeed, and utterly kindhearted. John, for his part, was so delighted to have all the neighbourhood come around, he was always out helping, and cheerfully paid for some of the materials that we needed. 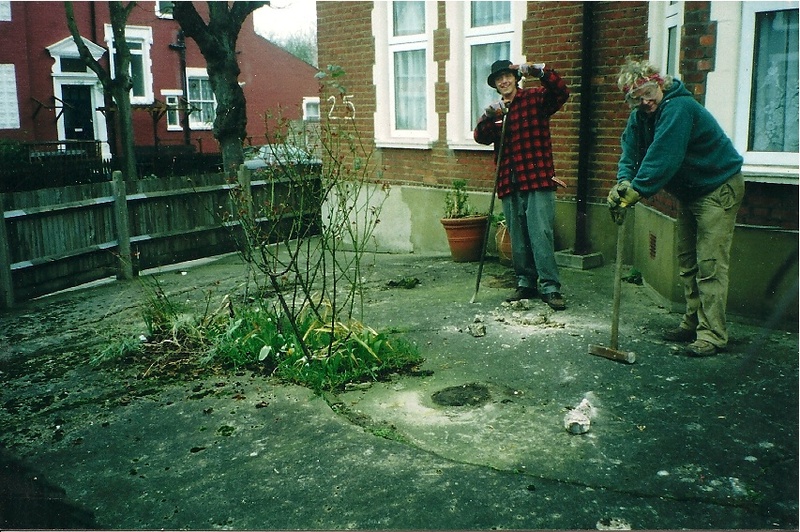 the neighbourhood indeed gathered around, and different people all said, “I want to buy a plant in memory of Steven.” Pam would bring out a big tray of tea and biscuits, and we’d slouch or crouch halfway through the project, and banter and chatter away. 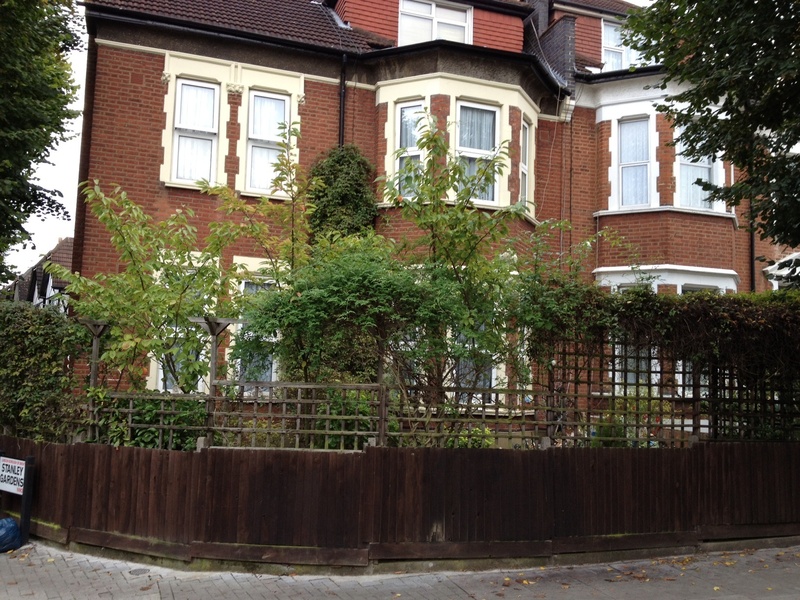 the delight of a neighbourhood gardening project. and the CHALLENGE of that particular gardening project! I assumed it would be a couple of inches thick, and I’d be able to lift it up with a pry bar. haha. the wretched concrete was a good ten inches thick, and seriously solid. I couldn’t believe it. just then, I had a house guest from Canada, Tad, Lorna and Paul’s boy, who was getting to know London, and was an amazing helper, a tribute to the capacity of the Canadian outdoorsman. 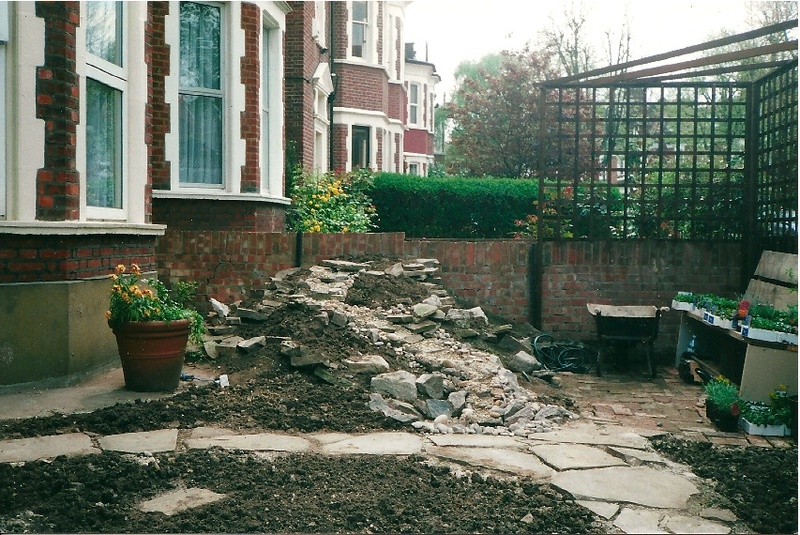 we loaded the skip with a good couple of tonnes of blasted concrete to be dragged off to some fresh hell. when the dust had finally settled, literally not metaphorically, we had a patch of dead soil. this subsoil released from the concrete tomb, was not ready to nourish a garden. John funded a large truckload of proper topsoil. interestingly, this arrived sterilised to as to kill any weed seeds, but preventing any earthworms from arriving. I had cultivated a compost heap in my back garden, nourished with kitchen scraps, which had become a flourishing wormery. 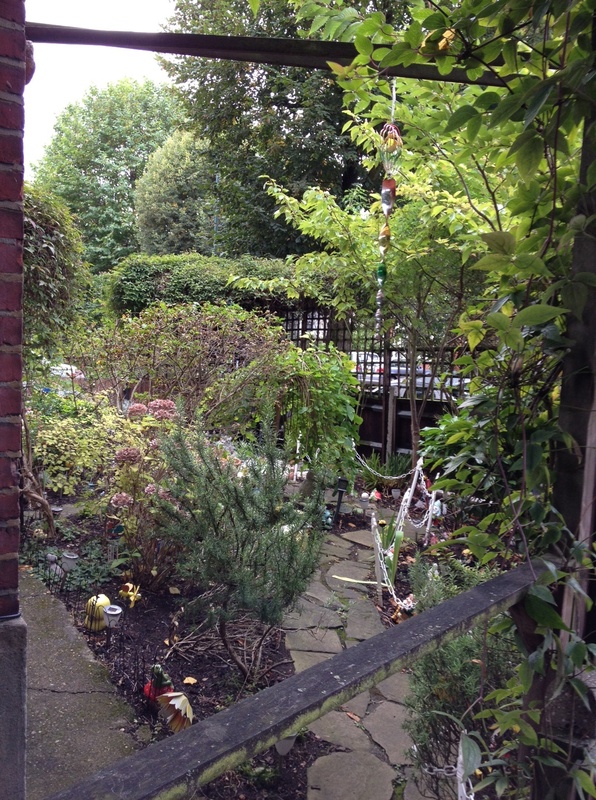 we transported all the happy wrigglers over to Steven’s garden for a Brave New World. 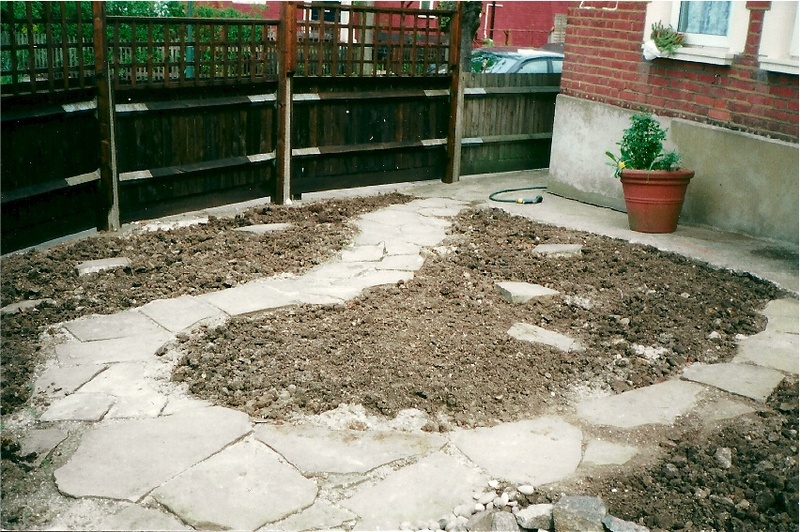 Salvage, salvage… Having torn up number 6 and discovered all the dormant York stone slabs, I was able to wheelbarrow them down the street and lay out a lovely twisting garden path, the spine of the planting. it terminated at a mound that we built up out of all the leftover fragments of mortar and pebbles. 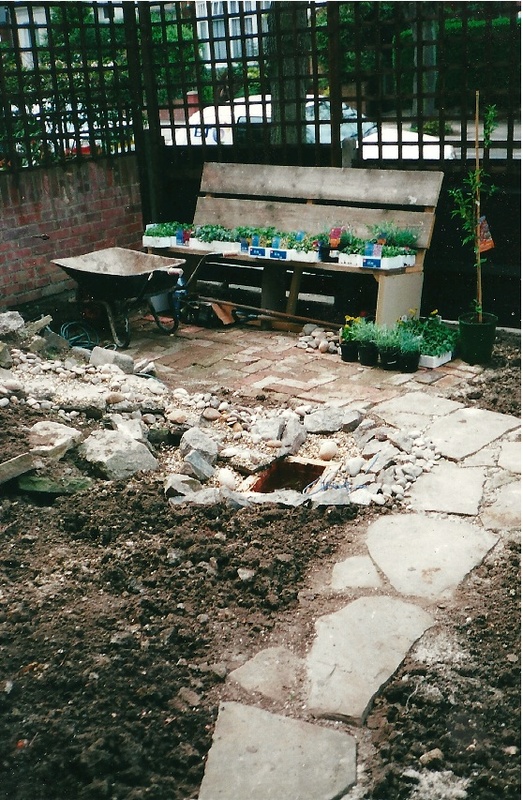 we covered the mound with soil, perfectly drained for a rockery. trellis all around, at the top of the existing wood fence, allowed us to train up the by now familiar ivy, clematis and honeysuckle. inside the fence, a row of flowering cherries. up against the house, climbing clematis, ‘Montana’, the hardiest and healthiest brand that I have yet found. believe me, if I find something that I can’t kill, I try to stick with that one. 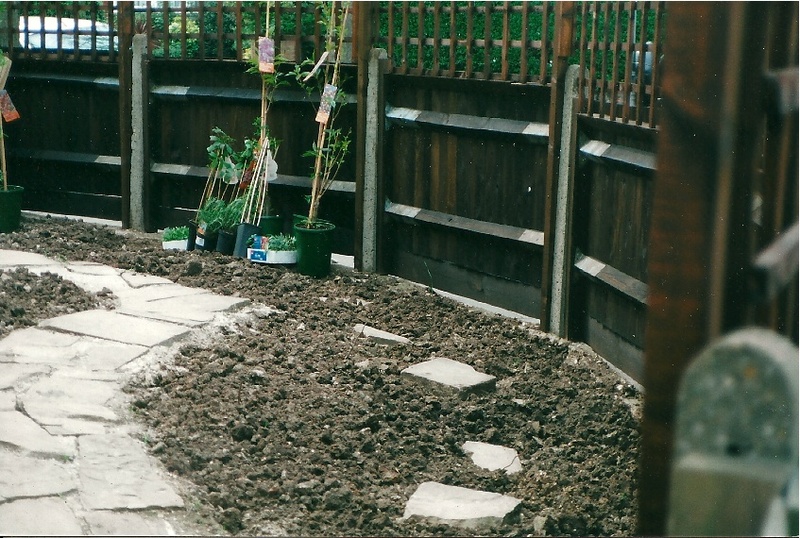 once the path was in place, all that remained was to fill in the sequence of planting areas. this, by now, was second nature. we did try to get adventurous by establishing a running water feature down the side of the mound. utter failure. 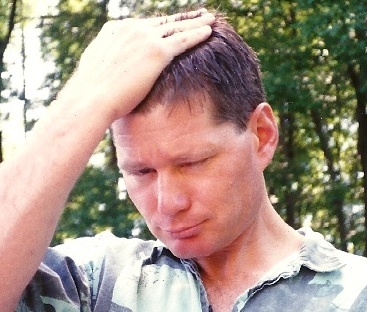 once again, defeated by water – this was getting to be a familiar story. it wasn’t til much later over in the Owl Studio garden [link to owl studio back] that I really realised how Fort Knox secure you had to make the falls and stream-bed, otherwise, the water will go its own merry way. in the corner, between the fence and the mound, we made a sitting area with one of my handmade benches. i suppose we can take it as a complement that someone liked it enough to steal it… damn. they bought another one, and chained it down. from there all we did was give Time time, and things flourished each after their fashion. for me, it was a chance to practice Letting Go as daughter Chrissie filled the garden up with more gnomes than you’d ever dreamed existed. not quite my personal style, but… Let Go… keep smiling.